A period of noticeable intolerance against Catholics after the French Revolution encouraged some French Catholics to immigrate to America, many settling in New York where French-speaking enclaves had already taken root. French culture had, by now, become fashionable in the United States; Dolley Madison closely following the French styles and wearing, almost exclusively, Parisian gowns. There were, however, no Catholic churches in New York that offered masses in French. French Catholics, unable to understand the English sermons, began simply staying away. Alarmed at the news, the Archbishop of Nancy traveled to New York in the 1830's and from the pulpit of St. Peters Church on Barclay Street preached a sermon in French. The purpose was clear: the French Catholics of New York must establish their own parish. The French immigrants listened. 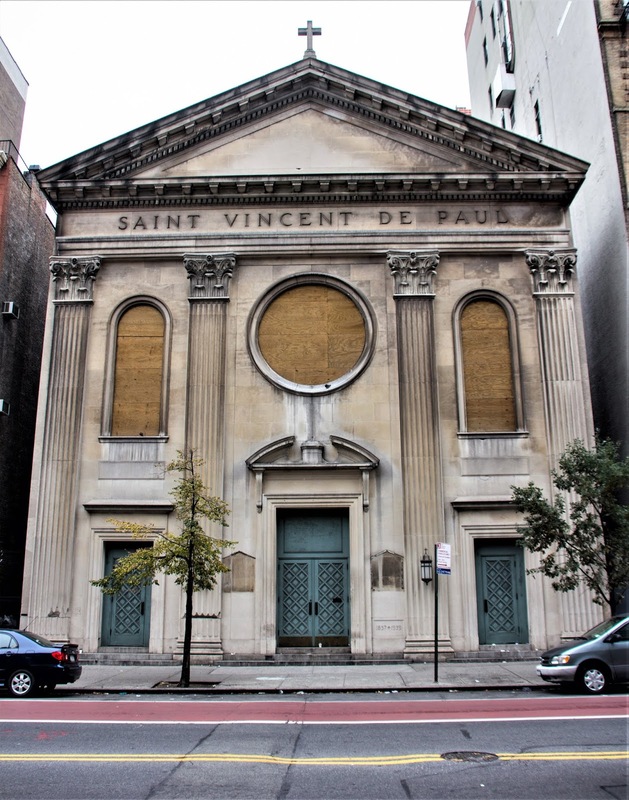 They established the parish of St. Vincent de Paul in 1841, erecting their first structure on Canal Street. In the years immediately preceding the Civil War, the parish had grown and a new church was planned uptown. 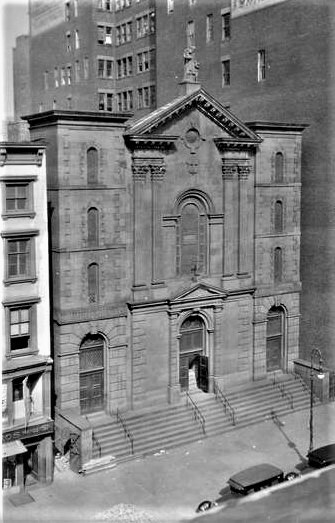 The congregation purchased land on 23rd Street between 6th and 7th Avenues and commissioned the architect Henry Engelbert to design the new structure. Engelbert would go on to design other notable churches, as well as head the renovation of the burned St. Patrick’s Cathedral on Mott Street. 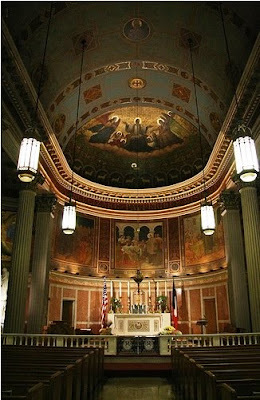 For St. Vincent de Paul he produced a classically-inspired temple. Completed in 1857, the interior featured inlaid marbles, mosaics, massive fluted Corinthian columns and brilliant frescoes. Father Lafont therefore opened the Catholic school to Black children, stressing that “They must receive the same moral and mental training as the white children.” When some of the white families threatened to move their children to other schools, the Father instructed the Black children himself in his home. Hearing of this, Haitian immigrant Pierre Toussaint, who would later be nominated for sainthood, helped fund Lafont’s endeavor. It would be another 70 years before another school for black children would be opened in the United States. In the latter part of the 19th century the neighborhood around the church the 19th century became the city's entertainment district. Next door was Koster & Bial's Music Hall, on the opposite side of 23rd Street was Booth's Theatre, and down the block was the Grand Opera House, to name a few. St. Vincent de Paul seemed, perhaps, out of place in its neighborhood of nighttime recreation. 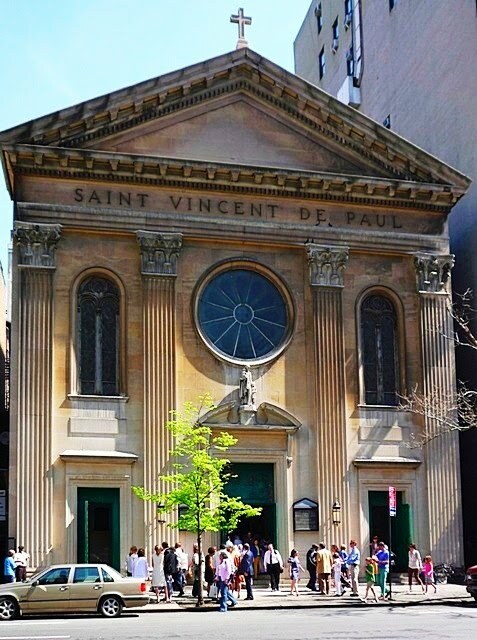 Because of Lafont's advanced social ideas, St. Vincent de Paul was the first Catholic church to invite both Black and white worshipers to partake in communion together. His foundation of racial and social tolerance never faltered. Decades later when New York took in Jewish refugee children from France at the end of World War II, the church offered comfort to them. The French-language masses continued throughout the 20th century, attracting Haitian immigrants fleeing the regime of Jean-Claude Duvalier, as well as Canadian, Belgian, Swiss and French-speaking Africans. It was here, in December 1961 that Edith Piaf married her final husband, Theophanis Lamboukas. Marlene Dietrich was her maid of honor. Despite its history-making social and religious innovations and its architectural interest, St. Vincent de Paul has never been designated a landmark. 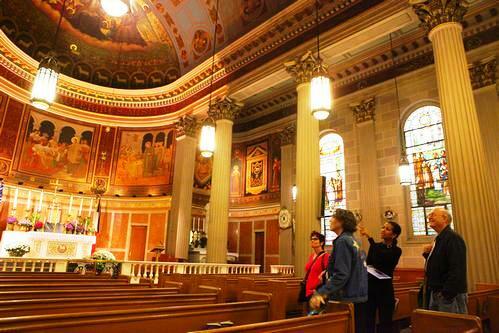 In 2013 the New York Archdiocese closed the parish, shuttering its historic structure. Sadly, the terrorist bombing on the block in September 2016 blew out the rose window and damaged the two arched stained glass windows on the front facade. I passed by this church yesterday. I'm sorry to say that it looks like it has been closed. The stained glass windows are now covered in plywood and the signage has been removed from the front. It has been closed. The diocese won that battle. One wonders if the interiors are heated to prevent damage. I noticed about a week ago that the limestone facade is suffering vandalism, too.